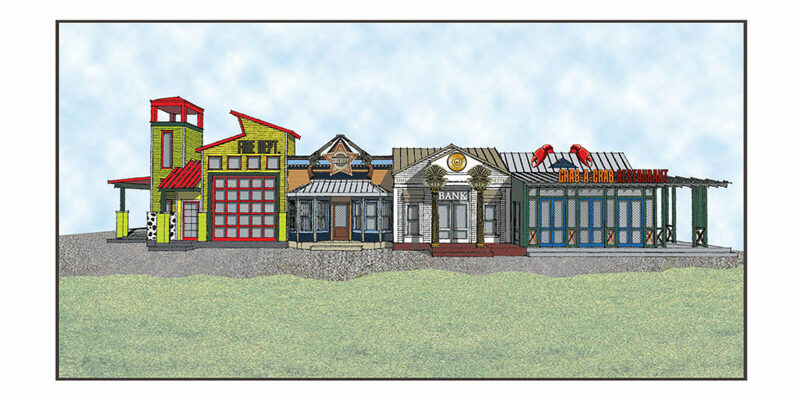 Envisioned as an entertaining, educational venue at the popular Tammany Trace Trailhead recreational rail trail, the design of Kids Town at Tammany Trace is intended to reflect the vernacular architecture of the Northshore, with influences of Gulf Coast colonial Louisiana architecture. The new miniature town, financed through the Tammany Trace Foundation, sponsors, and private investors, is now under construction at the Koop Drive Trailhead. Kids Town design draws inspiration from the cultural fabric of the early days of what was once the nation’s largest railway, and reflect a typical stop along the way. 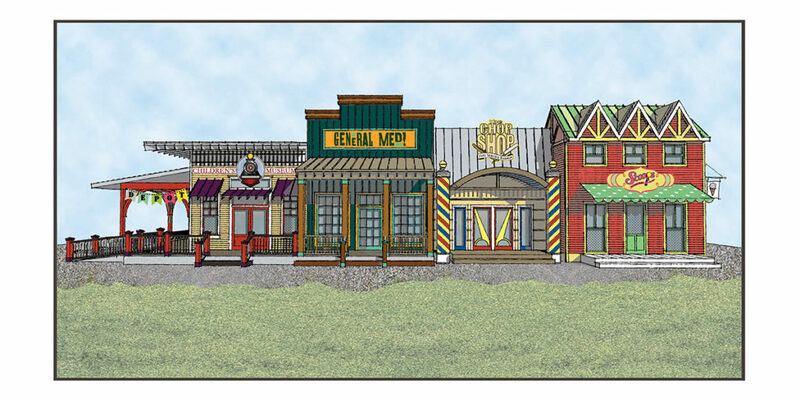 A Fire House, Bank, Mercantile and Ice Cream Saloon are among the attractions. Whimsically designed as if imagined through the eyes of a child, Kids Town will be a place where children will expand their imaginations through interactive play. Scaled to children, Kids Town allows them to play grown-up in an imaginative setting, being a Sheriff, Firefighter, merchant, banker, railroad engineer, hair stylist, barber or chef. Fostering independence in a safe environment, Kids Town includes a Town Square with a water feature, situated within a tree park, for families to relax in the shade while watching their children laugh, learn and explore. The Railroad Depot at Kids Town will also serve as a temporary location for the Children’s Museum of St. Tammany while its permanent home is built along the I-12 corridor. Ground was broken for Kids Town in summer, 2014. Construction is expected to take two years.